If you want to stay visible all year round, then look no further than our range of hi-vis polo shirts. Combine your polo shirt with a pair of shorts or ¾ length trousers in fluorescent colours. Then you'll be all set for a safe day on the job in warmer weather. 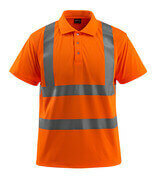 You will find hi-vis polo shirts in several of MASCOT's safety workwear ranges. The one thing that they all have in common is that they are all certified for both safety and visibility. 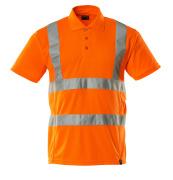 Our assortment includes hi-vis polo shirts in both single colour and two-tone combinations of the classic fluorescent colours: yellow, red and orange. So no matter your preference, you are sure to find a selection of hi-vis polo shirts that meet your needs. You can add a logo to your polo shirt without it being a risk to your safety. So long as the logo meets certain size requirements, then the polo shirt will retain its certification. The materials used in all of MASCOT's hi-vis polo shirts have been specifically selected to ensure optimal comfort, functionality and freedom of movement. A combination of polyester and cotton ensures that the polo shirt is both durable and comfortable to wear against your skin. 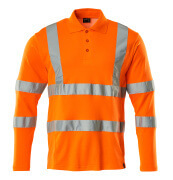 Many of MASCOT's hi-vis polo shirts provide ventilation under the arms, as well as elastic reflectors which ensure that you retain your freedom of movement. If you need pockets, then you will also find polo shirts in our range with side pockets for storing items such as your phone or eyewear. This is ideal for the summer, when high temperatures mean you will often be without a jacket. If you like a close fit, then choose a hi-vis polo shirt with a modern fit. 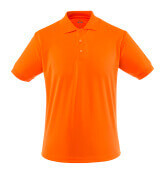 Or if you prefer something a bit looser, then MASCOT also offers polo shirts with a classic fit. 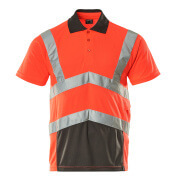 No matter which type you choose, here at MASCOT you will always find a wealth of options so that you can combine your hi-vis top with fluorescent trousers, shorts, ¾ length trousers and accessories.